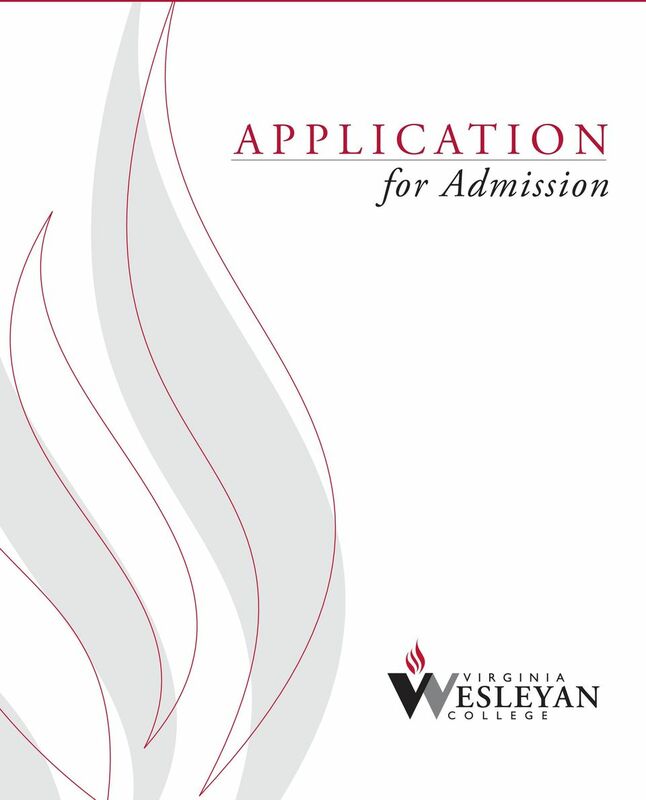 Download "A P P L I C A T I O N. for Admission"
2 Instructions Please read all instructions before completing your application to Virginia Wesleyan College. I. 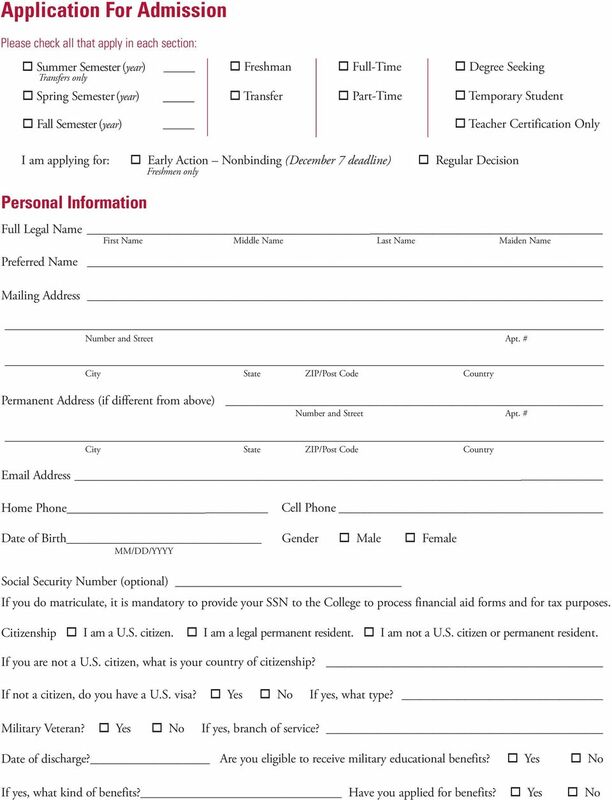 Application This form should be filled out accurately, legibly and completely. Failure to complete all sections of the application may result in a processing delay. If a question is not pertinent to you, put a dash or NA in the space provided. II. Application Fee A non-refundable fee of $40 must accompany the application form. Checks or money orders should be made payable to Virginia Wesleyan College. III. Credentials Required for High School Students 1. Application form completed, signed and accompanied by the application fee. 2. Official transcript from each high school attended, sent directly to the College from the high school. 3. Official copy of SAT or ACT scores if not provided on the high school transcript. Submission of SAT or ACT scores is optional if your GPA is at least a 3.5 on a 4.0 scale. Veterans and students over the age of 23 are exempt from the SAT/ACT requirement. IV. Credentials Required for Transfer Students 1. Application form completed, signed and accompanied by the application fee. 2. 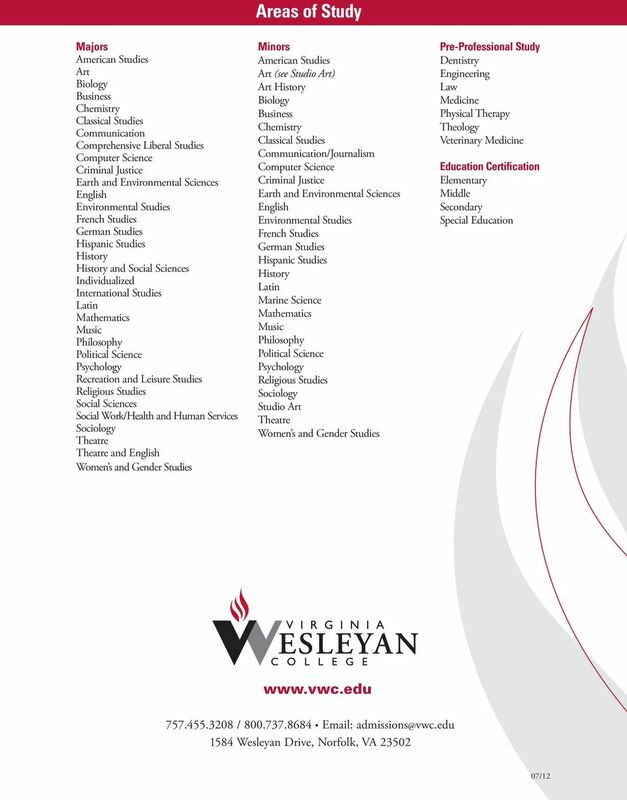 Official transcript from each college or university attended, sent directly from the institution to VWC. 3. Official copy of SAT or ACT scores if fewer than 12 credit hours have been earned. Veterans and students over the age of 23 are exempt from the SAT/ACT requirement. 4. Official copy of high school transcript if fewer than 12 credit hours have been earned. If you have earned at least 12 credit hours of college work, we still recommend that you have a high school transcript sent to us for placement purposes. We can use it for proper placement in foreign language courses, perhaps exempting you from some required courses. V. Applicants for Adult Studies Program Students planning to attend class evenings and weekends only SHOULD NOT complete this application. The appropriate application can be requested by calling VI. Additional Credentials Required for International Students 1. Official copies of TOEFL Scores, if native language is not English. The minimum TOEFL score for entrance is as follows: 550 written/ 213 computer-based/ 80 internet-based. 2. 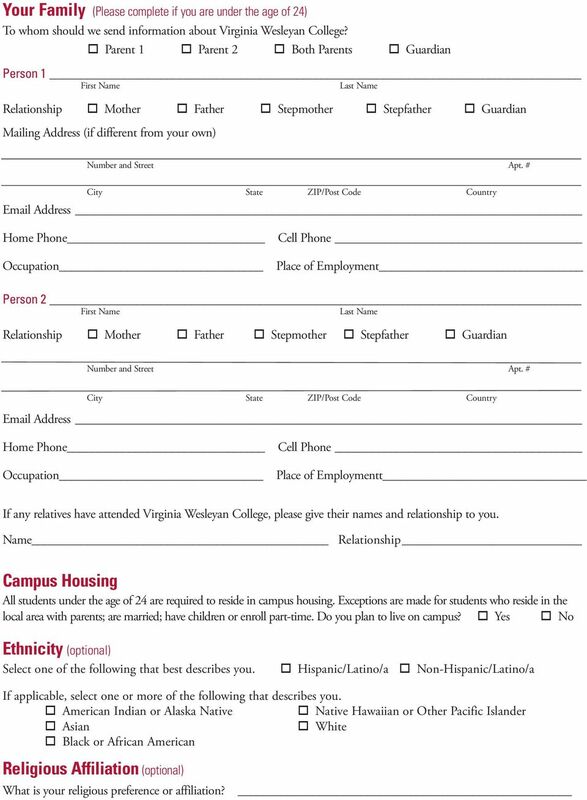 Completed Financial Disclosure Form, which will be mailed after acceptance to Virginia Wesleyan College. Please call us with any questions you have or with requests for materials and information. Send all completed materials to: Dean of Admission Virginia Wesleyan College 1584 Wesleyan Drive Norfolk, VA Local Toll-Free Fax For your records: Application and fee mailed Transcripts requested Date Date Please keep this page for future reference. 4 Your Family (Please complete if you are under the age of 24) To whom should we send information about Virginia Wesleyan College? o Parent 1 o Parent 2 o Both Parents o Guardian Person 1 First Name Last Name Relationship o Mother o Father o Stepmother o Stepfather o Guardian Mailing Address (if different from your own) Number and Street Apt. # Address Home Phone Occupation Cell Phone Place of Employment Person 2 First Name Last Name Relationship o Mother o Father o Stepmother o Stepfather o Guardian Number and Street Apt. # Address Home Phone Occupation Cell Phone Place of Employmentt If any relatives have attended Virginia Wesleyan College, please give their names and relationship to you. Name Relationship Campus Housing All students under the age of 24 are required to reside in campus housing. Exceptions are made for students who reside in the local area with parents; are married; have children or enroll part-time. Do you plan to live on campus? o Yes o No Ethnicity (optional) Select one of the following that best describes you. o Hispanic/Latino/a o Non-Hispanic/Latino/a If applicable, select one or more of the following that describes you. o American Indian or Alaska Native o Native Hawaiian or Other Pacific Islander o Asian o White o Black or African American Religious Affiliation (optional) What is your religious preference or affiliation? 6 Briefly describe any academic honors you have received or leadership positions you have held. School Year(s) Honors or Leadership Positions Check appropriate box(es) College Make it Official Have you ever been dismissed for academic or disciplinary reasons from a secondary school? o Yes o No If yes, please explain. Have you ever had a court conviction of any kind, other than minor traffic violations? o Yes o No If yes, please explain. o I grant my high school permission to release my transcript to Virginia Wesleyan College. Please sign the agreement below and attach your check for $40. o I certify that the information on this application is complete and correct, and I understand that the submission of false information is grounds for denial of my application, withdrawal of any offer of acceptance, cancellation of enrollment or any appropriate disciplinary action. I authorize Virginia Wesleyan College to verify the information I have provided with all of the schools that I have attended. I agree to notify the proper officials of any changes in the information provided. Signature Date Final Steps 1. 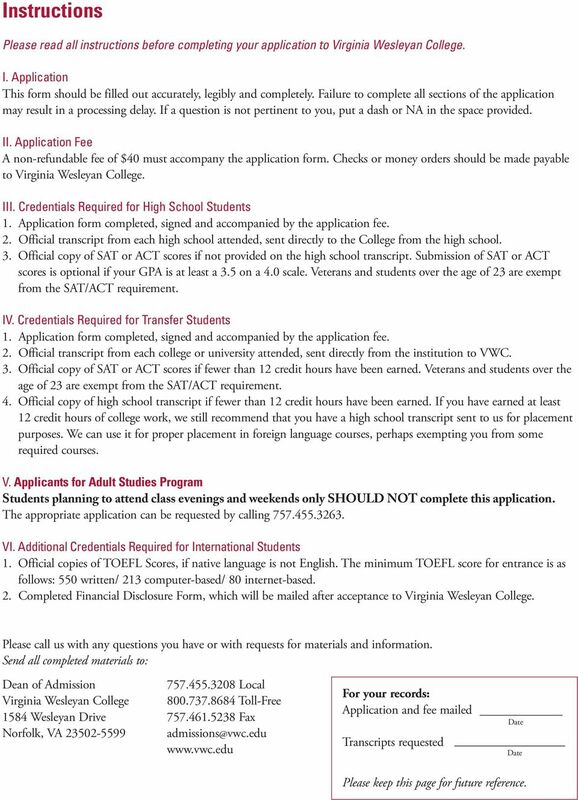 Complete and sign the application above and return it to the Virginia Wesleyan Admissions office. 2. 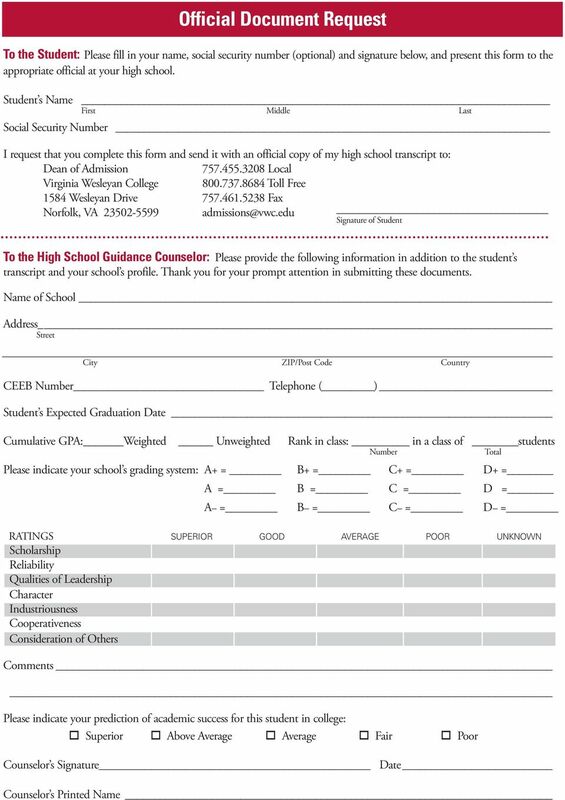 Deliver the Official Document Request form to your high school guidance counselor. 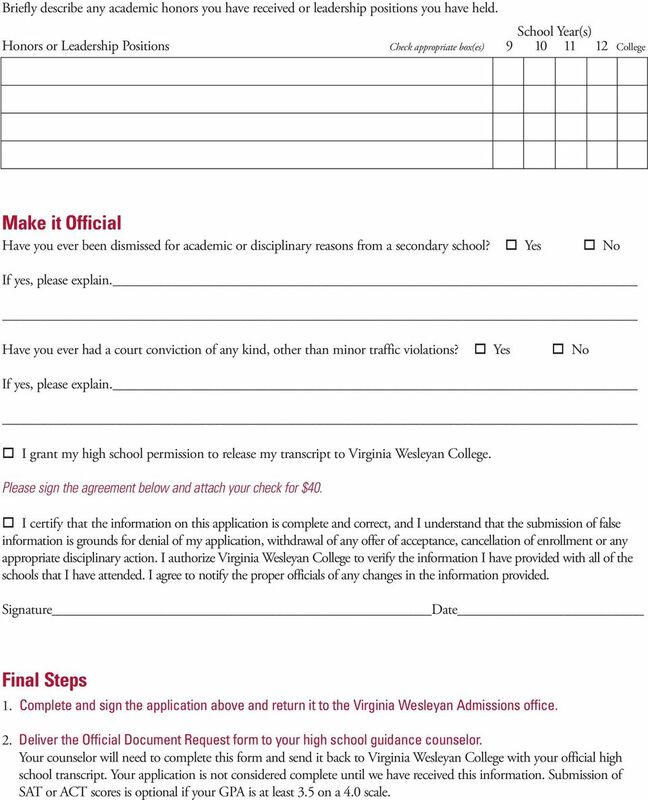 Your counselor will need to complete this form and send it back to Virginia Wesleyan College with your official high school transcript. Your application is not considered complete until we have received this information. Submission of SAT or ACT scores is optional if your GPA is at least 3.5 on a 4.0 scale. Elizabeth Akers Elliott Nursing Program Application The Elizabeth Akers Elliott nursing program is a twoyear (four semester program) leading to an Associate of Science Degree, with a major in nursing. Vocabulary: These words will help you understand this lesson. APPLICANT. Legal Name Last/Family/Sur (Enter name exactly as it appears on official documents.) First/Given Middle (complete) Jr., etc. Application for Undergraduate Admission International Students admission.marietta.edu Note: This application is intended for persons seeking/possessing F-1 student visa status and other visa categories. CANISIUS COLLEGE APPLICATION International Undergraduate Admissions EVERY JOURNEY STARTS WITH A FIRST STEP. Undergraduate Application I. APPLICATION INSTRUCTIONS AND INFORMATION The Admissions Office accepts and reviews applications on a rolling basis, allowing candidates to apply at any time during the year. 8. Permanent Address (Street or P.O. Box) City State Zip Code. 9. E-mail Address 10. Home Phone Number 11. Work Phone Number 12. 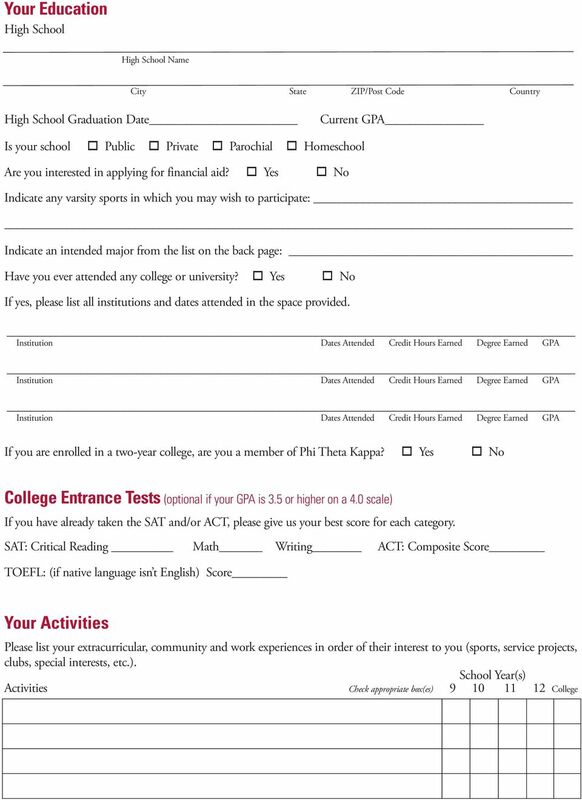 SOUTHERN UNIVERSITY A&M COLLEGE Application for Admission INSTRUCTIONS This application must be completed and returned to the Office of Enrollment Services before a student is able to register for classes. Graduate and Professional Programs APPLICATION The Mike Curb College of Entertainment & Music Business Applying for Admission Application Steps for Applicants: 1. Complete the entire application thoroughly. Please refer to the Chapman University School of Law Viewbook or the website at www.chapman.edu/law for additional instructions and information. Read all instructions carefully before completing the application form. Please PRINT the information requested in English. Undergraduate & Graduate International Application for Admission Instructions Read all instructions carefully before completing the application form. Please PRINT the information requested in English.